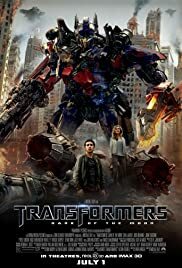 BEFORE: While generally regarded as a poor series overall due to lack of any coherent story, I’m taking my chances with what is supposed to be the best of the trilogy, Transformers: Dark of the Moon. At the very least I’ll see some great visual effects and lots of explosions. AFTER: I will premise this by saying that I have seen the first film, Transformers, but I have not seen the second film, Transformers: Revenge of the Fallen. The biggest criticism of these films is the plot, or lack thereof, so that’s what I’ll focus on first. There is major NASA involvement early on in the film and anytime NASA is involved, that’s big points in my book. John F. Kennedy’s famous speech about landing a man on the moon, footage of the Apollo 11 launch, and Neil Armstrong’s historical first step are all incorporated. A little later on, Buzz Aldrin has a very minor and brief speaking role and there’s also location shots at Cape Canaveral with crawler-transporters. So yeah, NASA plays a big role and for that reason alone the story is infinitely better than the first Transformers. But when it really gets down to business, there isn’t much meat to the plot. Almost all the explanation comes at the beginning (in the NASA portion of the film) and then for the next two hours, it’s a lot of robots, explosions, and wingsuit flying. No one expects a Transformers film to win an Oscar for Best Screenplay, but that doesn’t mean it can’t be entertaining. So let’s look at some of the other aspects. I was very impressed with some of the acting. Alan Tudyk did the best job by far followed closely by John Malkovich and John Turturro. Even Shia LaBeouf, who I usually cannot stand, was somewhat decent. By no means was he perfect but LaBeouf definitely improved from what I remembered in the original. There’s still some miscellaneous good and bad to cover. For the good, there’s of course the visual effects. When it comes to morphing robots ripping a city to pieces, you don’t get much better than this. For the bad, I had some minor annoyances with the editing. I felt the mixing of archival footage (Eagle landing at Tranquility Base) and new footage (Armstrong and Aldrin going to investigate the Cybertronian spaceship) in the beginning could have been done better. Transformers: Dark of the Moon lives up to expectations. It is a great eye candy film where you can shut your brain off and relax. This film even has the added benefit of some good acting compared to the previous films to make it even more enjoyable.